This past weekend my husband and I drove down to Nashville, TN for a long weekend. We had a ton of fun and one of the things I wanted to do was stop by one of my favorite independent bookstores, Parnassus Books. This is a wonderful bookstore co-owned by author Ann Patchett and I love to stop by whenever we find ourselves in Nashville and have a little time. As a librarian I don't often need to purchase books. I have a whole library at my disposal and I often get access to galleys and e-galleys. But it's important to me to purchase books by diverse authors so that I can show publishers with my DOLLARS that I want diverse books. It's one thing to show them with my words, which I try to do, and with my library dollars, but I also want to show them with MY PERSONAL DOLLARS. So much better when I can do that and support a great independent bookstore at the same time! I was so impressed by the diverse selection offered and displayed by Parnassus Books. They had diverse and own voices books heavily on display and faced out. There were many diverse books among their staff picks. They are doing what all libraries should be doing: championing marginalized voices and providing access! 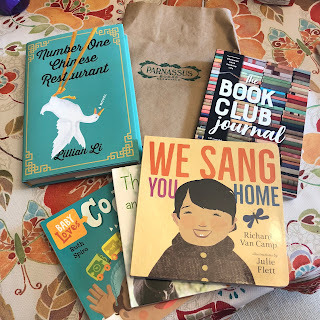 Number One Chinese Restaurant by Lillian Li (Henry Holt, 2018) was prominently on display as a staff pick and I have read some great reviews of it. Kirkus called Li "a writer to watch" and I love immigrant stories. I picked up The Book Club Journal off a display of the store's recent and upcoming book club selections. Although I already have a notebook designated as my book club journal, this one is specifically designed for the task with space to keep track of where the club met, what food and drink was served (always important!) and everyone's thoughts about the book. And of course I had to pick up some board books for my niece(s). I was so excited to see that they had two copies of We Sang You Home by Richard Van Camp, illustrated by Julie Flett (Orca, 2016) on the shelf! This is a super sweet board book perfect for welcoming a new baby and it's written by a First Nations author. It features a First Nations family and the message of welcoming and surrounding a new baby with love is so universal. It's the perfect first read-aloud and will be my first gift to my new niece (ETA late September)! More on that in a future post. I also grabbed one of the newest Baby Loves Science books - Baby Loves Coding by Ruth Spiro, illustrated by Irene Chan (Charlesbridge, 2018) - and The Babies and Doggies Book by John Schindel and Molly Woodward (Houghton Mifflin, 2018).